City Pub Group listed on AIM back in November. The company currently owns 38 managed pubs situated in London and the south of England. Twenty three of these pubs are freeholds (owned outright by the company) with 15 leased or rented. Thirty three pubs are currently trading with the remainder being refurbished. Thirteen of the pubs are in London and seven are in Cambridge. Other pubs are to be found in Bath, Bristol, Brighton, Exeter, Winchester, Reading, Southampton, Oxford and Norwich. The business started out in 2011 and began trading in March 2012. It has been run by some former managers of Capital Pub Company which was sold to Greene King (LSE:GNK) in 2011. The main focus is on selling drinks rather than food as this has better sales predictability and higher profit margins. This is because food has much higher labour costs (kitchen and serving staff) that drag down margins. The typical sales split of the pubs is 70% drinks and 30% food. There is a big focus on premium drinks such as craft ales, craft spirits and upmarket coffee. These products offer higher margins than mass market branded drinks. The food offer is also focused on high quality menus with some emphasis on locally sourced products. Pub managers are given a lot of freedom in running their pubs and are encouraged to be entrepreneurial. They also get a share of the profits; 2-3% of the company’s EBITDA is paid out to all qualifying staff in the pubs if the company meets its profit targets. City Pub is focusing on growing its estate of premium, unbranded pubs in affluent parts of the south of England. Each pub is given its own identity tailored to the needs of the local market. By avoiding brands it can operate a differentiated offer to various types of customers such as local residents, workers, shoppers, students and tourists. This lowers the risk of cannibalising sales when growing the estate. The company avoids very large pubs as these require significant amounts of refurbishment and maintenance expenditure in order to stay competitive. It also avoids very popular locations such as retail parks, high streets and shopping centres which typically have high rents and high running costs. Existing pubs from private sellers – These are already trading well and usually don’t require a lot of extra work. Existing employees are retained and the pub’s food and drinks supplies are transferred in order to boost profit margins. Pubs that need a lot of money spending on them – such as ones that have closed. Unlicensed premises – getting permission to turn former shops into pubs. The company uses property agents to find new pubs and also looks at pubs being sold off by the big managed pub companies who are getting rid of underperforming pubs. Once the pubs have been bought, the directors hope that by keeping interior layouts simple and with regular maintenance they will not need to have to be shut from time to time for big refurbishments. This means they stand a better chance of generating decent amounts of cash flow. Good locations and sensible strategy but will it make enough money? I think there’s a lot to like about the way that this company has set itself up. In particular, I like the focus on London and affluent parts of the south of England. This has long been the best part of the country to make money from pubs as the customer base tends to have more disposable income. You only have to look at the success of companies such as Fuller Smith and Turner and Young’s to see how a decent business model in this market can pay off. I also like the fact that there is a decent amount of asset backing to the business with the company owning the freehold of 60% of the pubs. The great advantage of freehold pub ownership is that there can be substantial asset value – especially in the south of England – to fall back on if the pub business doesn’t work out. It also gives the pub operator the flexibility to churn their estates and improve their overall quality by selling underperforming pubs. This can be very difficult and expensive to do if you are locked into long-term rental agreements on leased pubs. The premium drinks strategy, unbranded pubs and the buying and refurbishment strategy also looks to be very sensible. I do have a slight concern about how easy the company will find it to actually roll out the business with new pubs. Property prices in the south of England are high whilst there is likely to be competition for good pubs in good locations. It’s not unreasonable to ask whether City Pub can get it hands on good pubs at good prices. Paying too much runs the risk of disappointing returns on capital employed (ROCE) and a risk of losses if the asset is then sold. Just how profitable has City Pub Group been in the past? This is where my view of the company starts to go a bit lukewarm. I don’t like the company’s accounting for profit and think that returns on existing assets have been quite disappointing. I would say this business doesn’t look too bad at first glance. Sales are growing as you would expect given the increased number of pubs. Adjusted operating profits (reported operating profit with exceptional items added back) are growing and margins are improving. But there are a few things that put me off. 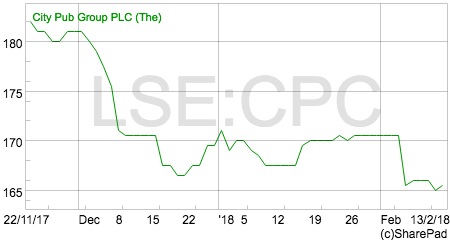 This is a company which goes on about EBITDA a lot which is not my favourite measure of profitability. It thinks that share option expenses should be excluded from its measure of underlying EBITDA. These are real costs just like wages and should be expensed in my opinion even if they are non-cash. The other thing I don’t like is the significant amount of exceptional items in the income statement. Not only do these make things messy they can often be a sign of aggressive accounting. Exceptional items are a way of companies having their cake and eating it. Some are legitimate if they are truly one-off costs that won’t recur. The problem is that too often they do and things like regular redundancy costs are just a cost of doing business. Companies want you to focus on underlying profits which means ignoring some costs so you can look at what has been termed earnings before the bad stuff. You need to keep an eye on the use of exceptional items as they can be and are abused by some companies. The big issue I have is treating pub pre-opening costs as an exceptional item. This is something I criticised Revolution Bars (LSE:RBG) for last year. This is a cost of doing business associated with a pub roll out strategy. It is an unfortunate – hopefully temporary – drag on profitability but that’s just the way it is. Companies want investors to credit them with any increase in profits from opening up new pubs so in my view it’s only right and proper that the costs of that strategy are properly expensed. I always find it useful to look at exceptional items as a percentage of adjusted operating profits. Anything regularly more than 5-10% is too much. On a trailing twelve months (TTM) basis to June 2017, exceptional costs were over 44% of adjusted operating profits. That’s way too much in my opinion and I hope to see that number come down significantly in the future. Using EBITDA to calculate cash return on cash capital invested (CROCCI). One of the ways in which EBITDA does some serve some use is in allowing the investor to calculate an estimate of the cash returns (EBITDA) on the cash invested in the business. The important thing with any measure of financial returns is that the profit number used must be matched with the right capital invested number. If you are using profits before depreciation and amortisation (EBITDA) you must compare that with capital employed with accumulated depreciation and amortisation added back. This is not difficult to do as the number can be found in the notes to the accounts. CROCCI should not be confused with the CROCI number that you will find in SharePad and ShareScope. 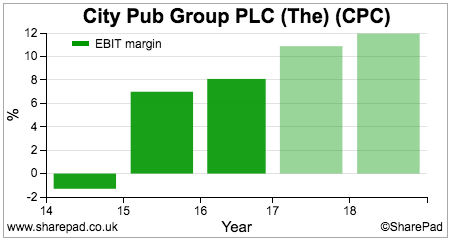 CROCI measures the free cash flow return on a company’s capital invested. With this calculation, the capital invested number is not adjusted for accumulated depreciation and amortisation. 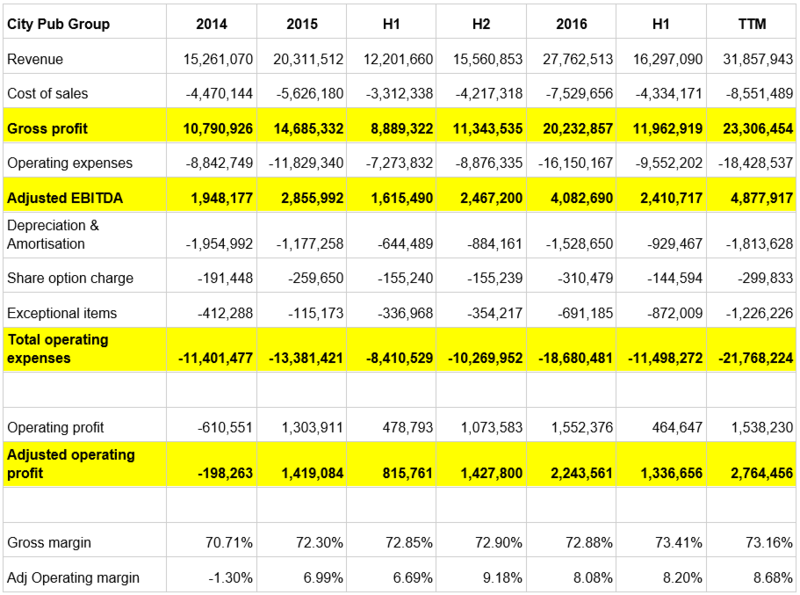 In the table below, I’ve calculated CROCCI based on the company’s adjusted EBITDA and also on my recalculated EBITDA. Pubs are not high returning businesses in general as they tend to tie up lots of cash in assets and operate in fiercely competitive markets. Depending on whose definition of EBITDA you want to use City Pub’s cash return on cash capital invested is somewhere between 6 and 8%.NIBCL is non interest bearing current liabilities. Just take the current liabilities figure and add back short term borrowing. That’s not a great number but to be fair to the company it is still quite young and will have pubs that are not earning as much money as they eventually will. Once they have matured then CROCCI is likely to go up a bit. Note how indebted City Pub had become on a Net debt/EBITDA basis by June 2017. This issue has been resolved with the proceeds of the flotation. I have been slightly lazy in this analysis by using period end values of capital employed rather than average values. Using averages would bump the returns up slightly. 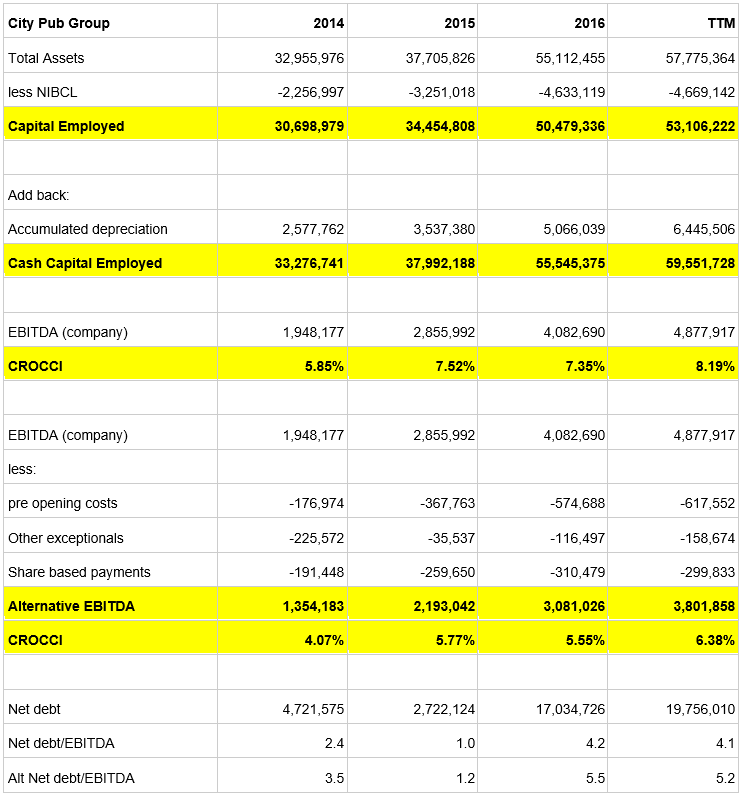 CROCCI would be 8.7% on a TTM basis using the company’s EBITDA and 6.7% using my alternative calculation. Here’s how three other pub companies look using the same period end approach based on their last annual results. There are only two City analysts out there with published forecasts – presumably the two brokers involved with the flotation. The pubs are currently trading well. Full year sales for 2017 announced last month were £37.4m and were driven by a very solid like-for-like sales growth of 3.8% for the year. This is up with the best in the sector and is a good result. Given the cost pressures in the industry coming from wages and business rates, this LFL figure suggests that profits within the existing estate are not falling as they are probably elsewhere in the sector. Analysts seem to be painting a pretty bullish outlook for the business given the roll out of new pubs. Profit margins in particular are expected to increase significantly over the next couple of years. If achieved, this should feed through into higher ROCE and CROCCI. These forecasts do need to be treated with a little bit of caution as they are likely to exclude pre-opening costs whilst the EBITDA number may also exclude any share payments. Investors are being asked to pay a high price for the shares at the moment. The rolling one year forecast PE at 165p is 22.9 times. This will be higher if certain costs are excluded from forecasts. The business does have substantial asset backing to its current £96m market capitalisation. CBRE valued 32 of the pubs in October last year at £73.65m with further pubs added to the estate since then. This should limit some downside risks to the share price. One thing to watch out for is potential share placings hitting the market. The main directors are subject to a one year lock in agreement whilst there are a couple of big venture capital shareholders who could look to offload their shares.